One of many tick-borne diseases that threaten your dog, anaplasmosis is nothing to sneeze at. Ticks are not only disgusting little blood-sucking creatures, they are dangerous, too. Ticks are one of the primary couriers for transmitting certain infectious diseases, collectively called “vector-borne [or, tick-borne] diseases,” of which canine anaplasmosis is one. Canine anaplasmosis can be found throughout the United States, primarily in the northeastern, mid-Atlantic, and north-central states, as well as in California. To see if anaplasmosis is in your area, visit the interactive map at dogsandticks.com and click on your region. One form of this disease is spread to your dog from the black-legged tick, also referred to as the deer tick, which also transmits Lyme disease. Another form can be passed to your best friend from the brown dog tick. If you're interested in what ticks look like and the different types of ticks lurking, visit dogsandticks.com (if you haven't gathered, we think it's a great resource for pet-owners who want to know more about tick-borne diseases). So, how do these nasty ticks infect your dog with anaplasmosis? Ticks acquire the bacteria that cause the disease from feeding on an infected host animal, such as a rodent or a deer. Then, they pass the bacteria to your four-legged friend by biting him and ingesting his blood. Although the two forms of anaplasmosis present with different signs, both may pose a serious threat to your dog's health and can be difficult to diagnose, based on clinical signs alone. Baseline bloodwork, including a complete blood count (CBC), chemistry tests, and urinalysis to evaluate organ function and blood-related conditions, such as anemia and clotting abnormalities. If your dog has been infected with anaplasmosis and is clinically ill, your veterinarian will most likely prescribe an antibiotic, such as doxycycline or tetracycline. The good news is that, in most cases, symptoms begin to resolve within 1–4 days! Your veterinarian may recommend repeating the CBC after your pet has been on medication for a period of time, to make sure the antibiotic treatment has been effective. 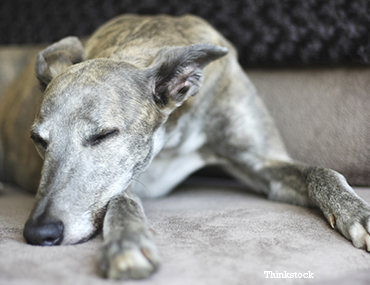 In more severe cases, some dogs require other medications or hospitalization. Protecting your best friend from ticks is the most important step in preventing her from contracting any tick-borne disease! Because the signs of tick-borne diseases, like anaplasmosis, are so varied, it is vital that you have your pet screened routinely for these vector-borne diseases. The good news is there are several ways to protect your pet and very effective tick-prevention products and medications available both over the counter and from your veterinarian. To learn more about these products, as well as more about how you can prevent your pet from being bitten by a tick, we recommend (again) you visit dogsandticks.com.